SailNet Community > Boat Builders Row > Pearson > Outboard on Pearson 28-1? Have any Pearson 28-1 owners made this conversion when their diesels died? It would seem complicated based on the facts that the transom hangs more than six inches off the water and the reach down to the bottom of the transom from the cockpit is fairly long, and in addition the rudder/rudder post hangs right at the end. Might have to do it so looking for others' experience. Also, does anyone know what happened to the Pearson 28 yahoo group? It seems to have disappeared. Thanks! Re: Outboard on Pearson 28-1? Just thought I'd close the loop on this for anyone else considering the conversion. I mounted a Garelick 2-stroke mount rated for 100 or so pounds or a 20 hp 2-stroke outboard because it was significantly cheaper than a 4-stroke labelled version. I had two 1/8" steel plates cut with an inch extra around the mount flange, which I then rolled by smashing a log of buttonwood down in the middle of the plates until they fit the curve of my transom. 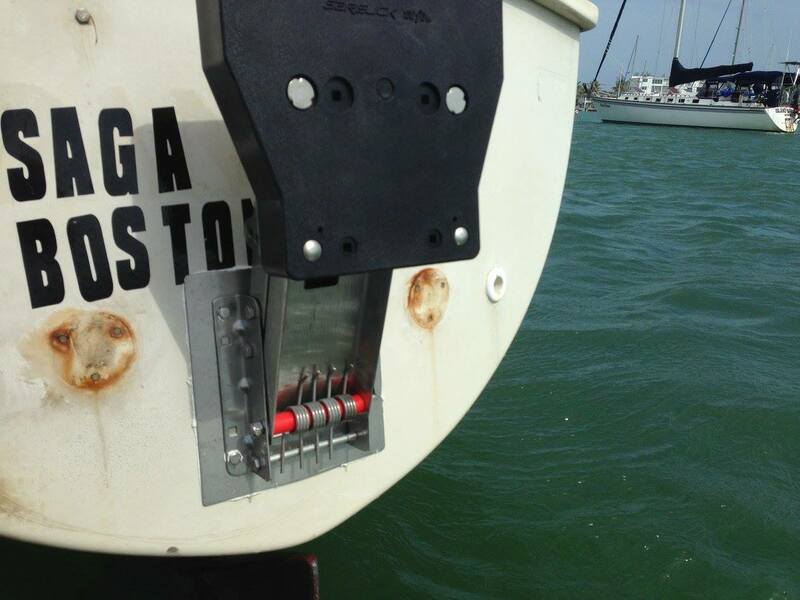 Tacked it up with 4200 around the seams and holes, using 3/8" 316 fasteners from West Marine. 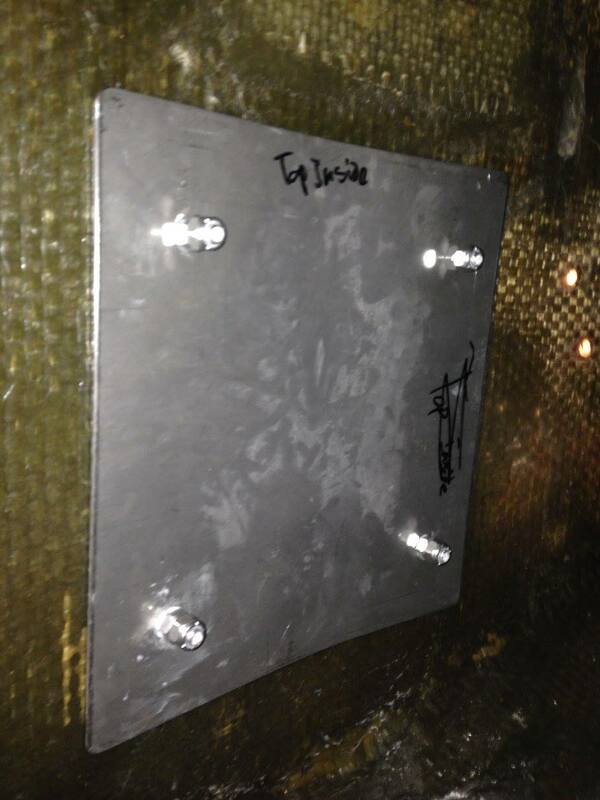 I placed it right above the bottom of the transom on the centerline of the boat. It supports a 6hp Tohatsu sailpro, which moves my boat at 5 knots or a little less while towing a 10' Avon Rover in a dead calm. I have 1500 miles and three months on this installation (though only about 70 hours, pretty much all on the Chesapeake and Dismal Swamp), and it all looks good after my cruise from Marathon to the Bahamas, through the Bahamas, north to Charleston, up the Pamlico and Dismal Swamp, and back home to Severna Park. The motor rips out in anything over about 2 feet, but the Sailpro has a rev limiter, the rip out will cause the outboard to spin on the bracket though. Starting and steering the outboard is easy, though I lose some visibility forward when docking the boat, but this is more than made up for by the fact that I now have a sweet stern thruster. Any chance you are still around and have pics of this bracket set up on the pearson 28-1? Yeah that's exactly what I was looking for. I still have the Atomic 4 in my boat and I am going to work on her a bit more this spring, but if it frustrates me like it did last season then I think I am ready to convert to the outboard and enjoy sailing again instead of engine maintenance . I see you had your 28-1 down in the bahamas at one point. I did the same with mine 10 years ago and then continued on the Virgin Islands. Now she is back in the lower Chesapeake (reedville/deltaville VA) and I plan on just doing weekend sails around the Bay which is why the outboard sounds like such a great idea. Does not look like you had to roll it that much to get it to fit the curve of the transom. Did your boat sit or sail any different when the weight of the engine was out? Last edited by seejoesail; 02-27-2019 at 09:08 PM. You're right, there was not much rolling, which I was thankful for as that ironwood wasn't light! It was also mostly a uniform depth on the curve, which made it a bit easier. The outboard worked much better with the weight of the universal 2-cyl diesel in there, for sure. It ripped out much more frequently once I took the diesel motor out back in Annapolis, to the point where I had to be careful where my guests were on the boat (if they were too close to the bow, it would rip out). I'd think about putting an extra 200 lbs of batteries or water tanks back there, personally. I've since sold the boat so never got around to those bits myself. Another option is those motor mounts that go on slide brackets, which would get the powerhead closer to the water and the prop deeper. I think I saw one example like that online, but I needed something quick and dirty stranded in Marathon. Another concern with the outboard in the Chesapeake (at least on the 28-1.2 which carries 5' of draft) was that the outboard usually wasn't strong enough or deep enough to pull the boat off any of the Chessie's sticky silt beds. I'm jealous of your Virgin Islands trip. I wanted to get down there, but lost so much time to my engine and other life things that I couldn't get there. Only chartering for me!